There are different types of meat which are categorized in 3 groups. The first group is seafood in which we can mention Antarctic krill, lipped mussel, tilapia, oysters, barramundi, anchovies, tuna, salmon, shrimp, sardines, lobster and crab. The second group is poultry in which we can mention quail, duck, turkey and chicken. In the third group we can mention goat, beef, bison, lamb and pork meat. The canned and frozen variants can be convenient. You should purchase meat from safe and clean seller or store. We know that the seawater fish have high amounts of salt which means that some people should avoid eating meat. Helps fetal development: There are many pregnant women who do not consume fish due to the mercury content. But this can affect the unborn child which means that its development and growth can be affected. Fishes are rich with an omega – 3 fatty acids. When women are eating fishes during their pregnancies, then this means that their babies can have better eye and brain development. After the pregnancy many women are having depression and this can be reduced if they add fish in their diets. Brain power: There are many different types of fishes which have Eicosapentaenoic acid (EPA) and Docosahexaenoic acid (DHA) which are very important for the normal brain and cognitive development. These kinds of meats will help you to improve the general function and concentration of your brain. Better skin, hair and eyes: You should consume meat that is rich with omega – 3 fatty acids because it can give many health benefits to your hair and skin. This component will protect your hair from the side effects of UV rays. Also it will give you the natural glow and it can moisture your skin. Meat also has Vitamin A which can ensure you that you have strong teeth and bones and healthy eyes and skin. Also there are some studies in which is shown that if you consume meat at regular base, then you can improve many conditions such as dermatitis, eczema and psoriasis. Heart health: The seafood has an omega – 3 fatty acids which can keep your heart healthy. This will reduce your worry for cardiovascular malfunctions. Also when you consume omega – 3 fatty acids at regular basis, then you will have decreased chances to get strokes, arrhythmias and heart attacks. There are many types of Vitamin B which are found in the meat such as Vitamin B6, Vitamin B12, panthothenic acid, biotin, thiamine, folic acid and niacin. They can help you to have normal function of your nervous system and to have proper formation of red blood cells and hormones. These elements will keep your nervous system and heart healthy and also they will help you to produce enough energy for doing the everyday activities. Improve blood circulation: One of the most important elements that can ensure you that you will have proper blood circulation is the iron. Also this element will ensure you that you will have normal transport of oxygen to all cells. There are different types of meat which are rich with iron. If you have iron deficiency, then this can lead to serious health problems and in the most cases you will feel weakness, fatigue and lack of concentration. It is very important to eat meats that are rich with iron in a combination of fruits that are rich with Vitamin C (such as oranges) because this will improve the absorption of iron. Improve digestive health: Meat is not rich just with proteins but also it is rich with essential amino acids. They will help you to have proper digestion. Our bodies cannot produce these elements by itself and this is a reason why we should consume these elements from the food. 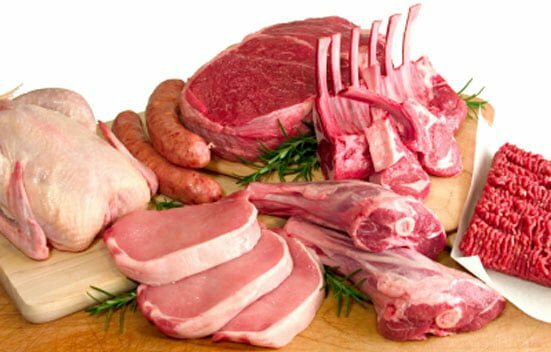 Meat is known as complete protein because it has nine essential amino acids which are named valine, tryptophan, threonine, phenylalanine, methionine, isoleucine, lycine and histidine. Also meat is rich with Vitamin D that is vital for the metabolism, calcium absorption and aids in strong bones. Promote muscle growth: The protein in meat can improve the muscle activity, repair the body tissues and it can build the body tissues. Also meat has zinc which in combination of protein will aid in the repair and muscle growth.